Another India-Pak encounter and another one-sided contest. It was a fairly straightforward win for India in Dubai today, but amidst the boring encounter, Rohit Sharma put forward a fine example of how to tactically plan each and every point in the game, and how it impacts the bowlers as a whole. Rohit’s acumen and superb bent of analytical mind have never been in question and it has even led to some suggesting turning in the reigns of the limited-overs team to him. It was a call that was too early to make, but Rohit’s tactical awareness was perfect today. Realizing he was not playing Zimbabwe anymore, Fakhar Zaman tried to follow the Rohit Sharma template, of getting settled before letting loose, against the quality pacers at India's disposal. That was where Rohit’s intelligence came into play. He brought in the mid-wicket and took the mid-off wider while asking his bowlers to not allow any room to the batsmen. The batsmen were of course under pressure and Rohit then pulled off a surprise by introducing Yuzvendra Chahal into the attack. It was an interesting ploy given that Zaman only averages 16.00 against leg-spinners and the move worked like a charm as he started becoming impatient before eventually perishing to Kuldeep Yadav. But, it was not the sole instance that Rohit excelled today. Knowing Shoaib Malik counters spinners easily, he took the duo of Chahal and Kuldeep out of the attack and brought in Bhuvneshwar Kumar and Jasprit Bumrah for a couple of overs to trouble Malik before taking them out again. It was a very good chance to take even if it didn’t work. 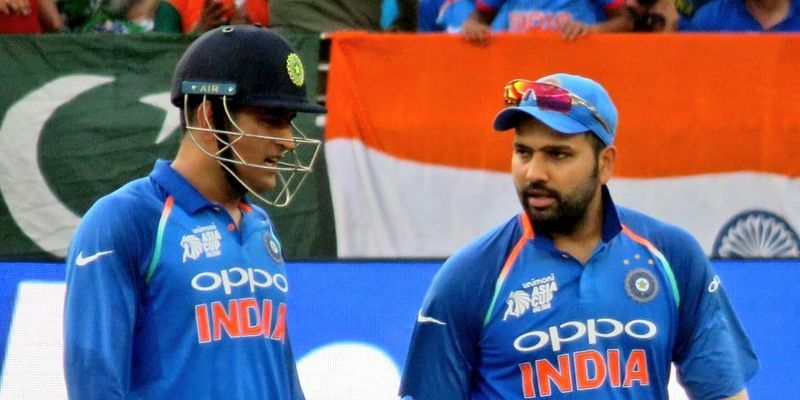 But, in the latter phase of the game when the pace duo was operating, Rohit again stuck with the short mid-wicket and put a long-on to lure the batsmen. The bravery was quite visible and something that played to Pakistan’s minds as they curbed their leg-side play to a considerable measure. Result - 38 runs in the last seven overs. In the league match against Pakistan, Bumrah’s figure didn’t justify the contribution that he had in the game. He picked up two wickets by conceding only 23 runs, but his two wickets were lower-order batsman Faheem Ashraf and No. 11 Usman Khan. On the other hand, his new-ball partner Bhuvneshwar Kumar was terrific with the ball and bagged the man of the match award even. But was Bumrah a silent spectator in the game? The answer is No. He helped build the pressure from the other end by refusing to provide an opportunity to either batsman to open their arms, which in turn helped Kumar pick up those wickets. In that game, the maiden that he bowled to Zaman forced Imam-Ul-Haq to charge against Bhuvneshwar Kumar on the first ball of the next over, giving up his wicket in the process. Bumrah’s next over was another maiden, and the piled pressure resulted in Zaman playing a false shot and giving his wicket away to Bhuvneshwar. That was the sort of the partnership they enjoy and brought that to the fore today once again. Even in the powerplay, the duo stuck to their plan of sticking to the stump line and didn’t deviate from that. They married that with pace and accuracy which meant the chance of off-side runs dried up completely. When Bumrah decided to restrict the run-flow, Bhuvi took the benefit of the same and managed to put Pakistan off the blocks. It was a partnership that worked excellently well as they conceded only 28 runs in the first 10 overs and 38 runs in the last seven. In an era of dead bats and big hits, it is extremely rare to see a team being confident of a win by scoring 300 runs. It was a clear aberration of those of the 90s or even the early 2000s when a 250 was considered as a winning total. With the concept of a safe score getting too much of importance, international cricket has somehow forgotten when the last time a wicket as placid as UAE’s was a norm. Look at Trent Bridge or Mumbai for that matter. None can convincingly say that how much would be enough. But, Dubai has come up as a welcome break from the norm. It is a pitch that has already hosted 29 ODIs, but have only once seen a batting team crossed the 300-run mark. Even chasing is never an easier formula as there have been only five run chases of between 230 and 250 in ODIs in Dubai - three have been won and two have been lost - 236 (lost), 238 (chased), 247 (lost), 247 (chased) and 238 (chased today). Here, opening the arms in the death overs is as difficult as doing the same in the middle-overs. While the bounce was there, the placid nature of the tracks made it difficult for the batsmen to hit the ball on the go. Something that the 90s kid grew up watching and probably only Dubai takes them on a journey to their childhood.